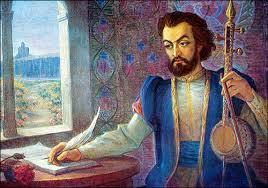 Sayat Nova was born in 1712 in Tiflis. Troubadour alternately celebrated and then fallen out of favor at the court of Irakli II, he was banished by the king in 1759. He became a monk at the monastery of Haghpat He was so punished for his love for Princess Anna Batonashvili, the king’s sister. Sayat Nova was killed by the army of Agha Mohammed Khan that devastated the city of Tbilisi and its surroundings, in 1795. Posted on jeudi, juillet 31st, 2014 at 9 h 56 min.